Grant covers it all, from the sublime to the cringe-worthy. Austin Forkner said he was feeling stronger than ever heading into the first East Coast round of the season and felt like he was better in almost every aspect, and then he went out in the first practice and threw himself into the ground a few times. He crashed a couple more times before the qualifying sessions were over and I don't think I'm alone when I say that I was thinking the same may happen during the actual races. He has had a tendency to implode whenever he makes a mistake or two throughout his young career, after all. But no, he looked fantastic during the night show and not only did he win, but he got the holeshot in both his heat race and the Main Event and never looked back. He was never challenged, and really no one was ever even close. He was smooth and consistent during the races, and mature and articulate during the post-race press conference. Very impressive stuff. And while I think Jordon Smith may be able to challenge Austin as the season goes on, this was a statement ride for the #24. Considering that Jordon's mechanic was finishing up a tire change as the 30 second board went up, and that Jordon crashed at one point during the race, I'd say that he will take this second place finish all day long. However, he's played the part of Mr. Consistent the past two seasons and has come up just short both times, so I definitely expect for him to push hard for wins as the season goes on. It should turn into a decent championship battle between Austin and Jordon, too, since they were both running similar times the entire Main Event. We'll all be patiently waiting for them to both get a good start and have an actual battle. Christian isn't in this spot because of his performance, but because of his situation. He was expected to be a title contender on whichever coast he ended up racing, but a small crash during the off season left him with a thumb injury that was pretty slow to heal. He only rode a Supercross track once before deciding to give it a shot and heading to Minneapolis. His heat race turned into a bit of a nightmare when he got caught up in a crash early, but he moved through the field pretty impressively and was able to transfer to the Main Event. It sounds like he just couldn't hold on and keep pace for the entire Main Event, though, which led to a 20th-place finish. I was really hoping to see Christian battle for a title this year, but it really seems like he just has bad luck every time things have been going his way for a while. Solid preparation for a championship can be thwarted by one small tip-over at a test track. I hope he's back to 100% soon. 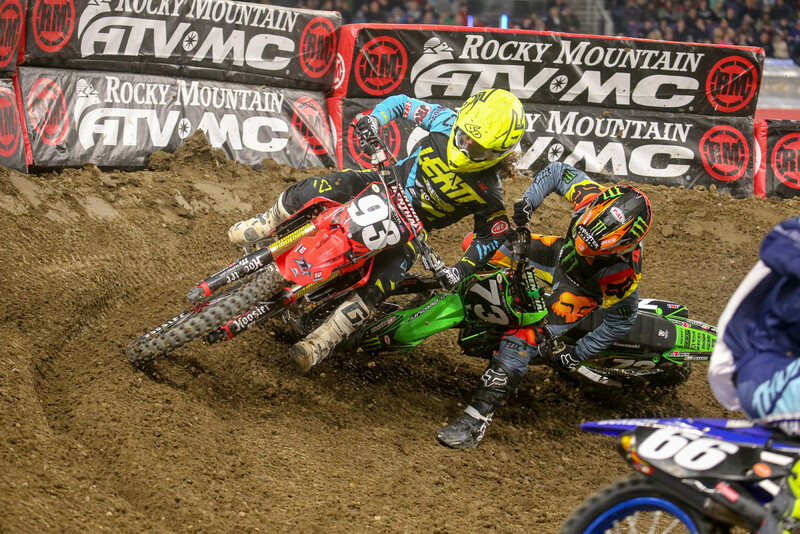 It was veteran-on-veteran violence in Minneapolis as Alex Martin took out Martin Davalos a few laps into the Main Event while Martin was in second place. And while he kept racing, that was about it for Martin. He put down a couple more quick laps after getting up before his lap times started rising pretty sharply. I'm not sure if the bike was twisted up or if maybe he was a little beat up, but he didn't fight much the rest of the Main Event and walked away with a 16th-place finish. This is the second year in a row where the East Coast opener was a bit of a nightmare for Martin. Last year, though, he was pretty seriously injured and had to bow out of the series after a couple of rounds. I'm hoping that he's physically okay this time around and can try to mount a comeback of some sort. He needs to have a solid season this year if he hopes to remain a factory rider or garner the interest of 450 teams. He may have faded back to fifth place (and then was gifted fourth by Blake Baggett) towards the end of the Main Event, but Joey is really starting to show his potential in the 450 class. 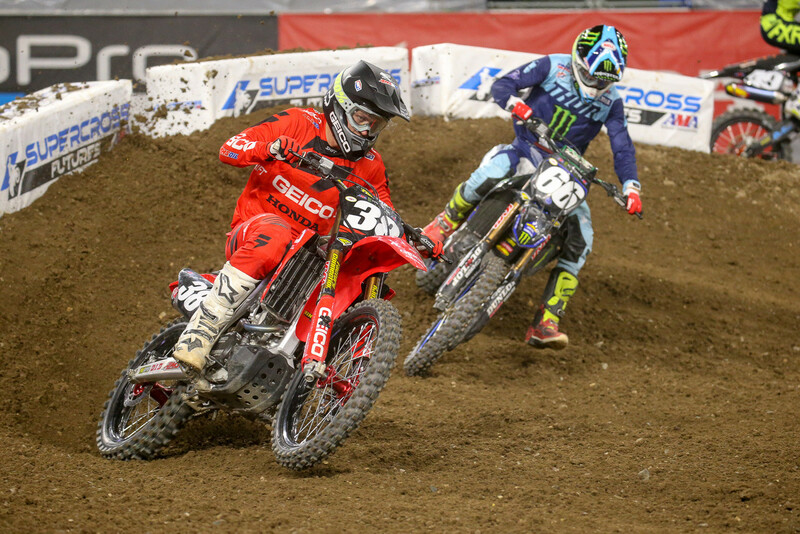 We saw a hint of it at the Monster Energy Cup, and then we were all left wondering a little bit when he struggled early in the season, but he has been solid the past two weekends and he looked mighty comfortable out there leading on Saturday night. His confidence is starting to show, and if he continues to establish himself as a top-eight mainstay with the chance of top-fives and eventually a podium, Kawasaki is gonna have to start considering a contract extension for the rookie. I think many of us expected Joey to struggle in the 450 class after how disappointing and weird his final season in the 250 class was, but he's proving us all wrong, and it seems like a lot of people are starting to change their opinion of him. This dude is just a mystery to us all. At this rate, he'll still be getting top-tens well into his 70s. 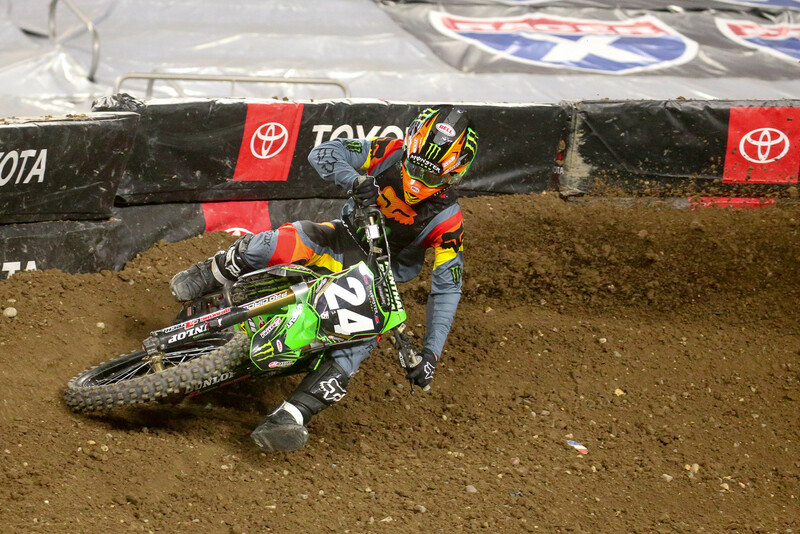 I'm not really sure what else to say other than you really cannot ever bet against Chad Reed. Give him a factory bike and he's going to do well. I don't think he's really in the conversation for wins anymore, but c'mon, he has been putting in some impressive rides this season given how stacked the field is. The biggest question I have is that if he continues to score top-tens fairly consistently throughout this season...is he gonna race again in 2020? That'd be pretty bananas. "Eli's gonna go on a roll!" - Most people in existence after San Diego. Eli, however, decided to take a nap as the 30 second board went up and get a 16th-place start on a fairly one-lined track. And really with how the track was, coming back to sixth after the start he got is a good salvage job by him, but it's definitely not what he was aiming for at his first race this season with the red plate. Ken Roczen is now the red plate holder once again, and the top four in the championship are separated by two points. Yeah, two! Wild stuff considering we're a third of the way into the series at this point. It'll be interesting to see what happens in Arlington. Will Eli steal the red plate back? 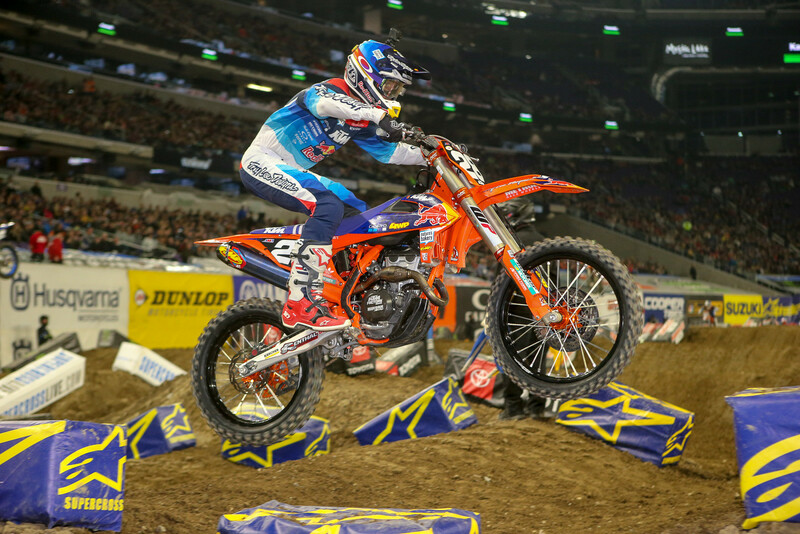 Will Roczen hold onto it? Or will someone else take it? Blake's been on a good race/bad race pattern this season, and so Minneapolis was scheduled to be a good race for him after he struggled in San Diego. It was going well, too, until the very end of the Main Event when he hit a kicker in one of the more difficult rhythm lanes and got plowed hard into the face of a jump. According to his team, he walked away with just some bumps and bruises, which is great to hear because if you saw the replay of it...it could have been much worse. The most unfortunate part about all of this is that it dropped him to seventh in the standings and effectively killed his chances at the title once and for all. But, now that the pattern has been broken and he has had two bad weekends in a row, does that mean he's in for a spectacular weekend in Arlington? Guess we'll see. The Minneapolis track layout was the first real dud of the season, in my opinion. I'm sure a big reason for how simplistic it was was so that the 250 East Coast guys didn't destroy themselves at the first round of the season (although many of them sure did try), but it ended up being a short, one-lined track that provided intense but rather uneventful racing action. On paper, Arlington's track looks fairly clean-cut as well, but hopefully multiple lines develop and next weekend sees some better racing. That's all folks! Who were your Good, Bad, and Ugly picks for Minneapolis?